Created as part of our Loving Hearts campaign with Heart Research UK, our survey found that only 10% of 4,139 women over the age of 18 exceed the recommended 150 minutes of exercise a week. This is despite 31% of women being able to identify the correct time period recommended by health experts. While 7% of women said they exercised between 121-150 minutes a week, it was found that 22% said that they exercised less than 30 minutes during a seven-day period. Interestingly, the survey found that there were variations in exercise attitudes and habits between geographical locations. When asked what the recommended weekly amount of moderate physical activity was in minutes, only 25% of women in Wales could offer the correct answer. However, 35% of women in the South East gave the correct answer of 150 minutes. They were followed by women the East Midlands (33%), the South East (33%), Scotland (32%), Yorkshire and the Humber (31%). 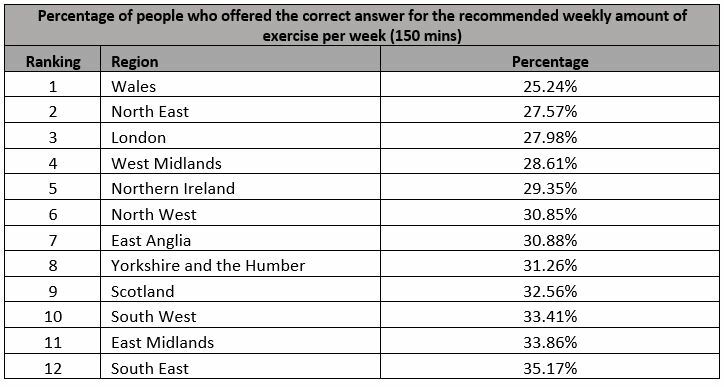 When asked how much moderate intensity exercise women took part in during the week, the results also varied throughout the regions. 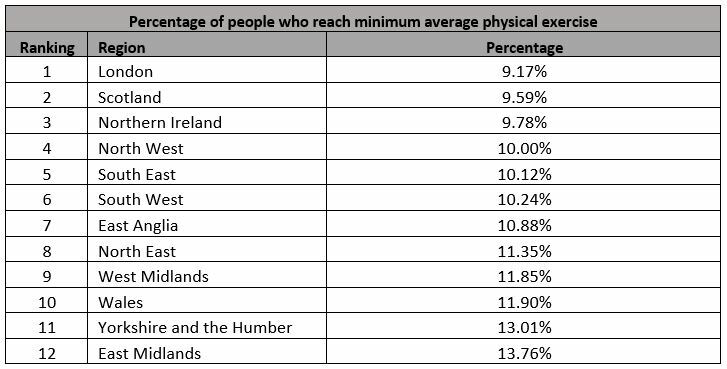 A total of 13.76% of women in the East Midlands were found to exceed the recommended 150 minutes, followed by 13% of women in Yorkshire and the Humber, and 11% in both Wales and the West Midlands. However, the were also regions where women admitted taking part in no physical activity whatsoever. 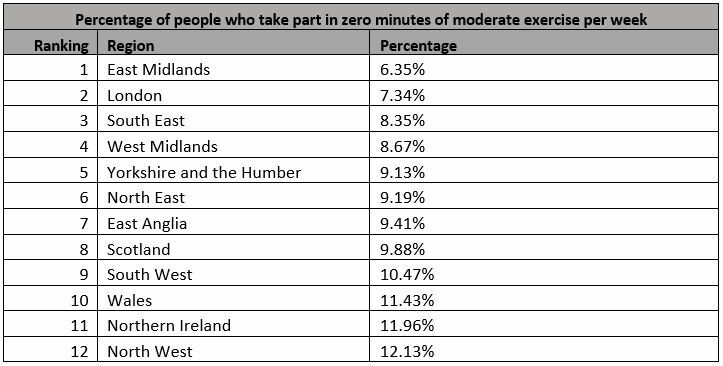 The highest percentages of women taking part in zero exercise per week was found to be in the North West at 12%, followed by Northern Ireland and Wales at 11%, and the South West at 10%. Heart disease can affect anyone at any age. Heart disease is the term described for when the heart’s blood supply is blocked or interrupted by the build-up of fatty substances or narrowed blood vessels. Other forms of heart conditions, such as those that affect muscles, valves, or rhythms, are also considered forms of heart disease. Symptoms can include chest pain, tightness and discomfort, as well as shortness of breath, pain, numbness or weakness in the arms and legs. This can also be accompanied by pain in the neck, jaw, throat, upper abdomen or back. Heart disease can be prevented by healthy eating, an active lifestyle, and the avoidance of drinking and smoking. You can even check your personal heart age by using the NHS Heart Age Calculator, here.